In fact, the NC General Assembly made it permissible for the previous owners, SunTrust Bank line of credit to encumber your property post closing. And you have no way of knowing. With SunTrust Bank “booking” fake loans against the assets of unknowing North Carolina homeowners and leveraging those loans for Capital the question becomes, who makes the principle and interest payments to cover all their fake loans? What bank do you know, whom out of the goodness of their heart would advance payments on behalf of a delinquent homeowner? 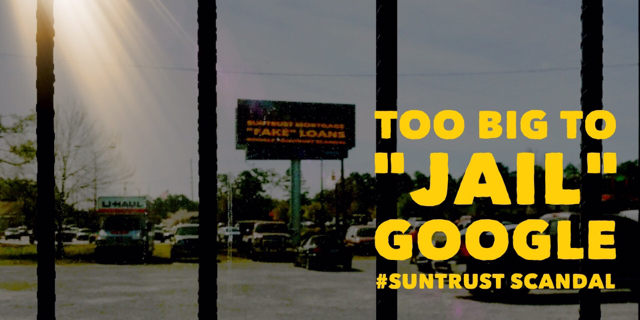 Has SunTrust targeted your homes equity in its fake loan account scheme? North Carolina homeowners are learning the harsh results wherein SunTrust Bank “Oversold” secured interest in their customers homes. Did the previous owners of your home have a mortgage with SunTrust?? In the last post we explained how SunTrust extracts the equity from your home to secure “Loans” for the benefit of SunTrust Bank. Read this close, it’s not the homeowner who’s being foreclosed on, it’s SunTrust Bank who’s in default.. Being SunTrust defaulted and can not meet its obligations to its “Funder” in the secondary market, the trustee forecloses on your house. You see, but in this case, the foreclose is by way of an instrument or mortgage against your house, you signed years ago and long ago paid off. There is a foreclosure against your home, we’re not reporting any negotiable credit reporting; because SunTrust is in default with its “Funder” and we (the bank) provided your homes equity to secure capital to fund the bank, and we’re sorry but the foreclosure is listed in your name as your name is on the “security instrument” being foreclosed upon. This should be of grave concern to anyone with a SunTrust Mortgage or one lingering as a Hidden SunTrust Lien in their chain of title. Homeowners are at risk due to SunTrust Bank “Overselling” and or retaining, warrants and or derivatives which encumber your home. SunTrust Bank calls them intangible assets, when their simply a lien against your house. North Carolina homeowners appear to have the highest risk of having their homes foreclosed upon by Investors who are currently pursuing SunTrust (Debtor) for repayment. It appears SunTrust Bank apparently bought and sold (brokered) so many fake loans as a Marketmaker it couldn’t keep track of the liens, nor could it’s mortgage subsidiary keep up the payments, ultimately with SunTrust Mortgage being declared in “Default”. The practice of dealing in fake loans creates conflicting claims from various creditors whom previously were unknown to the homeowner / purchaser is of great concern. Now, don’t be fooled, the homeowner isn’t the purchaser, your the “Renter / Tenant” the purchaser is China and others hostile nations that buy our mortgage backed securitized debt obligations, knowing the full faith of the American government in most cases backs it. The extraction of your homes equity is reduced and memorialized your assets into an electronic document of title as security and or lien against your house. Here the homeowner’s not in default, nor is there a loan between SunTrust Mortgage and this homeowner. Josh Stein the NC Attorney Generals Office was unable to force SunTrust Mortgage to produce a default letter as requested by the homeowner. SunTrust Mortgage was the SELLER and defaulted, by failing to pay sums owed to their LENDER requiring their lender / funder to send the below referenced LENDER Default Letter to the Debtor (SunTrust Mortgage). Again, it’s SunTrust Mortgage who borrowed the money from the LENDER and leveraged the homeowners property as collateral. ** Regulators don’t overlook the above and be sure to follow the below $1.65M lost note back on the same property where you will see it originated two owners prior back in 2004. 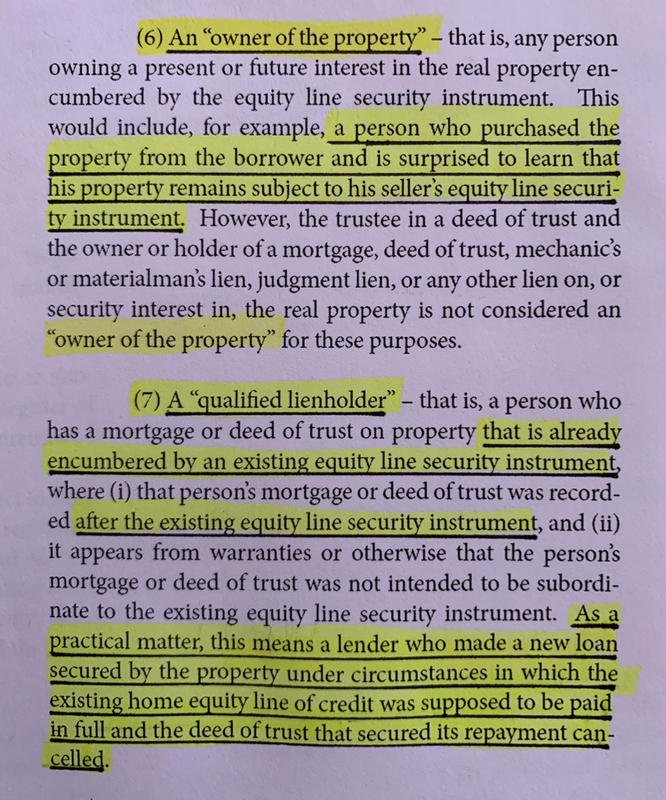 Why is SunTrust, a “State Member Bank” underwriting and acquiring “Equity Securities” (Fake Loans) reducing purported loans into “Book-Entries” and subsequently “Dealing” in these “Off-Balance Sheet”, intangible assets (aka fake loans) otherwise known as Mortgage Servicing Rights (MSR’s). Thank you to those employees @ #BOA for sharing this developing thread. If any current or former SunTrust Employees wish to make contact you can reach us by simply picking a user name and messaging us. Please consider sharing on Facebook as it’s unknown just how many loans SunTrust has defaulted on harming unknowing homeowners. Securities and Exchange Commission advised investors, Mr. Lienhard informed SunTrust Board of his retirement November 1, 2018. Update - Federal Reserve Investigates SunTrust Bank over allegations the Bank and its Mortgage subsidiary retained mortgage payoffs, booking millions of dollars in #FakeLoans. Meaning your foreclosing on SunTrust, to indemnify a fake loan and it’s your Trustee and their related attorney that makes off with $700K of your shareholders funds. 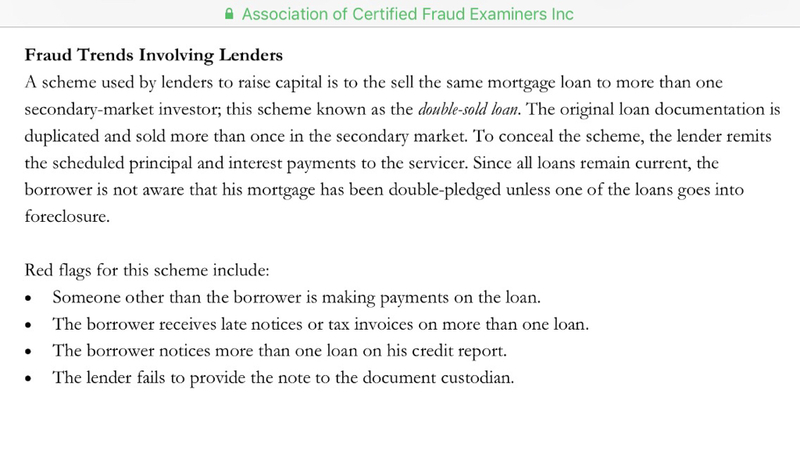 Problem is, with the same Trustee “Knowing" this was a contested Fake Loan case and the Trustee then went ahead and refiled all the while set to pick up $700K in combined "Fee's" off serving as a "Disinterested Party" while representing both sides at inception of filing. Now this is good... Why do you expect Trustee Services of Carolinas, LLC. 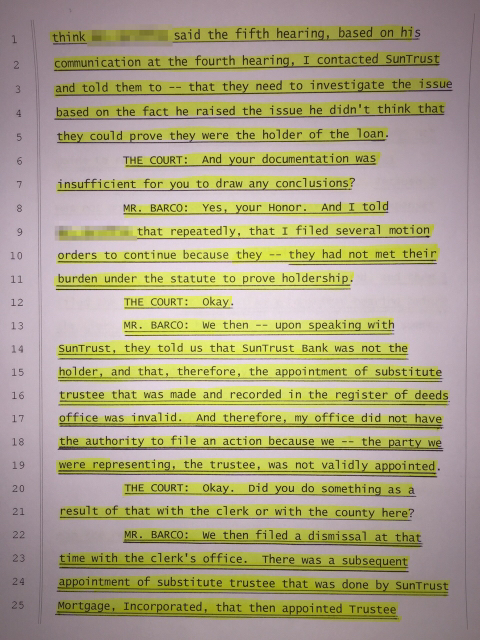 allowed TWO separate Lender Affidavits one with STM posturing as an admitted Fake "NoteHolder" (of a Wet-Ink "Copy" of the Original Note) and another with STM as the "Holder" each the Clerk "Time Stamped" at identical times?? Nor have I been provided an opportunity by the Trustee or a court to "Authenticate" this specific Wet Ink "Copy" of the Original note. My "Genuine" Wet-Ink Signature was applied to one original Note, that's not been lost. On another note, why is the “SunTrust Executive Vice President of Mortgage Operations” nominating “Convicted Criminals” to "Execute and Deliver” certain loan documents such as “Affidavits, Attestations, Pleadings, Assignments and Insurance Activities” on behalf of SunTrust Mortgage, Inc. (the “Corporation”)?? I didn’t realize SunTrust was so reliant on “Convicted Criminals” to carryout its Mortgage Miscarriages. Any chance they stole all your Lost Notes? Or are they still “Double-Pledged” like the original loan among others via December 22, 2008 SOT. SunTrust continues to use this "Borrower" to "Wrongfully" create over $6M of fake loan value for SunTrust. Has SunTrust disclosed this all to the Wells Fargo Board of Directors serving "Notice" of the fallacies and as Master Servicer? Or how about U.S. Bank National as Trustee? Be sure you closely review the attached Substitution of Trustee dated December 22, 2008, and compare the Borrowers to the signatures on the "uncanceled" notes from 2005... it's clear your Trustee didn't. While I've got you, anybody fired this past week? to foreclose on yourself indirectly due to tangled web of lies, false testimony and double pledged SEC Securitized loans you do not hold. He said is he the bank man that "times'es" all the banks notes twice?? I said no son, he's just a nice man at the bank that had that "Special Loans Department" where they allegedly did "Laundry" from September 18, 2007 through December 31, 2010. If you have a SunTrust Mortgage or Home Equity Line from SunTrust Bank you will want to pay close attention. Shortly after SunTrust originated your loan, your loan is typically bundled with other loans and transferred in this case to Wells Fargo. However, Wells Fargo and the Investors in these large pools of loans in many cases (Hundreds of Thousands) never physically received the loan documents from SunTrust. These must have documents include, the Wet-Ink Note, Deed of Trust or Mortgage and are required to convey the 1) Right to Receive Payments under the underlying Note and 2) The Right to Enforce. Meaning, many homeowners are paying a party that lacks any rights in your loan. These rights include for example, the right to collect your payments. Said another way… Do you know who owns the rights to your loan? Are you paying the party who holds the rights to receive your payments or just a third party loan level sub contractor such as SunTrust Mortgage? Suppose they didn’t have your loan documents? Suppose they knew these documents did not exist yet you continued to pay this disinterested party. Being a party not privy to the loans benefits how would this party be able to cancel your specific debt after you satisfied the debt? This leaves many still owing the original face about of the loan plus years of interest and fees, all payable to the correct Noteholder. When you call to inquire about your loan, they use 5 terms interchangeable by design… They are: Lender, Servicer, Owner, Investor and Holder. However it's the “Note-Holder” who in most every case holds both the right to collect and the right to enforce. Recently a borrower called SunTrust to pay off their loan, the employee looked in the company’s computer system for the Promissory Note, telling the borrower it was an original. When questioned SunTrusts Single Point of Contact went on and next, the note had morphed from an “original” into an “original copy”, “original imaged copy” and finally she said it was a “CURRENT VERSION” of the Original Note”. In a separate case when one Wells Fargo employee became aware of all of these missing notes from SunTrust they honestly conveyed the issue to the customers, their supervisor and others within Wells Fargo. Within 24 hours they had received multiple emails from Wells Fargo headquarters that the loan documents were in-fact missing and that the company did not have the customers note to enforce the loan or collect the past payments. Rather than Wells Fargo forwarding the wrongfully collected payments to the correct note holder, something big occurred… Wells Fargo trickled out “Balloon” Letters to borrowers and directed its employees to lie to its customers and treat the loan like it was a “Balloon-Loan” and its final balloon payment was soon due…. This achieved several things… First, an unsophisticated borrower or elderly homeowner perhaps may actually believe the bank and pay off the fake balloon loan again that was far from being due. Second, those families that were unprepared and unable to pay off the fake balloon loan were fortunate, in a sick way… Wells was ready to help them by way of a “Modification” or in its true sense “Double-Book” a loan that SunTrust nor Wells Fargo held a right to, all by way of all new wet-ink loan contract. You see, this really helps SunTrust. As SunTrust escaped having to buyback / repurchase hundreds of thousands of defecent loans stemming from SunTrust materially misrepresenting and warranting said loans in the secondary market. You see SunTrust was broke. They owed the Private Federal Home Loan Bank “Billions” in off balance sheet loans secured by “questionable" collateral…. This while the SunTrust shareholders dividends remained at near recored lows. Meaning the “Too Big to Jail” bankers make out, the elderly likely cashed in financial products resulting in costly prepayment penalties and those who modified their loans now owe a SECOND loan and STILL Owe the Original loan which is payable to the current Holder of that still VALID Debt and is hidden behind a wall known as MERS.